We had a great day at the beautiful Central Library showing Lost Objects, it proved to be a very bustling and busy event with families of all shapes and sizes passing through to see all the wacky and crazy gadgets and tech on display. We got some really great reactions and interest from children and adults alike and we're even more stoked to keep working on interesting content, and getting the iOS version of the app ready soon. 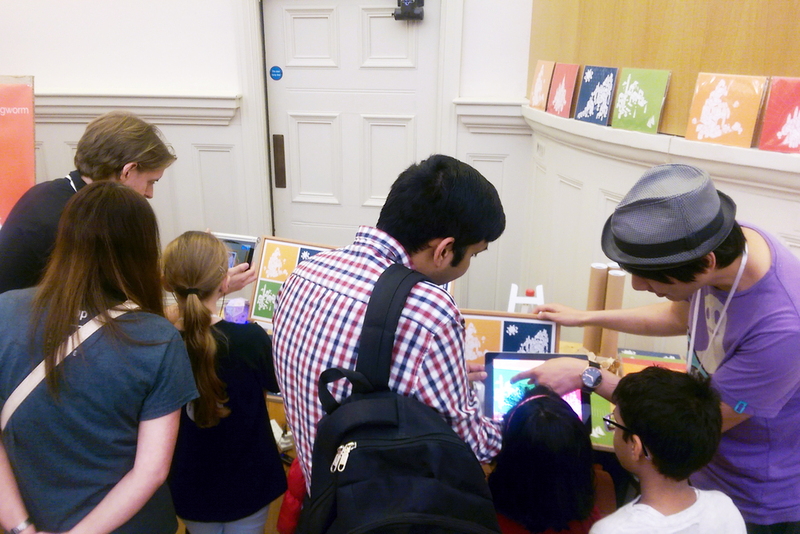 We're super excited to have a stall at Liverpool Makefest for the first time, it's a fun event with technology, gadgets, science and inventions, so we'll be showing our augmented reality art project 'Lost Objects'. So come and say hi at Liverpool Central Library on Saturday 25th June! Another great promo video by our buddies over at Draw & Code! Once again we are excited to be creating something for Liverpool’s one-night arts and culture festival! This years theme is ‘Experiment’ and along with our good pals atDraw & Code, we’ll be showing off a fun new interactive visual experience at 92 Degrees Coffee’s event “Synaesthesia”! Starting to hatch plans for Light Night 2016, watch this space! We got into the festive mood at the Winter Arts Market, where we sold our laser cut key rings and badges and debuted a new paper toy. A DIY luminary based on the asorable Dumbo Octopuses of the deep sea! We were among some amazing artists selling our new laser cut key rings and badges alongside one of our Co-Founders Stephen Chan's work. We had an amazing Light Night on Friday, there was a great turn out in Liverpool for the festival this year and we were made up to see so many people stopping by 92 Degrees, with yellow guide in hand, to peruse our wall display and get hands on with doodling and our paper craft workshop. Throughout the evening, animation and projection mapping specialists Draw & Codeprovided bright and colourful animations with our geometric shapes, and great music from one of their DJ’s to set the mood. Draw The Line also covered the tables with paper and provided pens in all colours for anyone and everyone to doodle as they mingled and sipped on their coffees. The ‘gems’ from our workshop were decorated and put together by members of the public, and are currently up on display with our installation at the coffee shop. Thanks to everyone who came and joined in and we hope you all had an amazing Light Night. A video promo for the event will be up soon! Our awesome friends at Draw&Code have done a write up and a sneak preview video for the LightNight collaboration extravaganza with them and the Draw the Line doodlers on Friday! We’ll be at the INPRINT Festival with some shiny new creations that we’ve been working on, so come down and see our stall on May 31st at Camp and Furnace! 1 Month Till Light Night! We’ll be collaborating with Draw & Code and Draw The Line to display some cool tech and art at 92 Degrees Coffee in Liverpool, but we’ll also be having our very first workshop! So if you’re in Liverpool for Light Night stop by and try your hand at some paper crafting, while looking at cool immersive technology displays and sipping on some damn fine coffee!